Pictured below is a 747-8 Freighter in Korean Air livery. SEATTLE, March 18, 2011 /PRNewswire/ -- Boeing (NYSE: BA) and Korean Air today announced an order for two new 747-8 Freighters. The order value is $639 million at Boeing list prices. "Korean Air continues to strengthen its reputation as one of the world's leading global cargo carriers," said Marlin Dailey, vice president of Sales & Marketing, Boeing Commercial Airplanes. "Boeing is very fortunate to have Korean Air not only as a customer of the 747-8 Freighter, but also the 747-8 Intercontinental and also as a key partner on the 747-8 program." 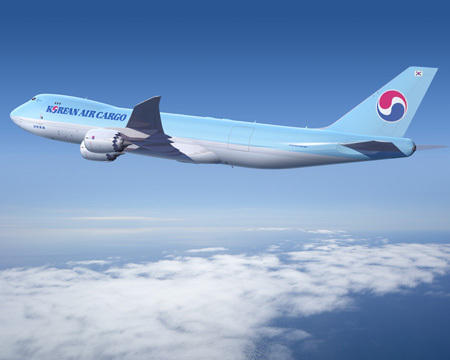 "The 747-8 Freighter will provide tremendous economics and reliability to Korean Air's global operations," Dailey said. In December 2009, Korean Air became the first airline to order both the passenger and freighter versions of the 747-8. With this order, Korean Air has five 747-8 Intercontinentals and seven 747-8 Freighters on order. The 747-8 Freighter offers a range of 4,390 nautical miles (8,130 km) and a maximum structural payload capacity of 154 tons (140 tonnes). It also offers an additional 4,221 cubic feet (120 m3) and 16 percent more revenue cargo volume than the 747-400 Freighter. The airline currently operates a total 27 Boeing freighter airplanes and will become one of two airlines to operate both the 747-8 Freighter and the 777 Freighter. Korean Air was the number one cargo airline in the world for the sixth consecutive year in 2009, according to World Air Transport Statistics compiled by the International Air Transport Association (IATA).